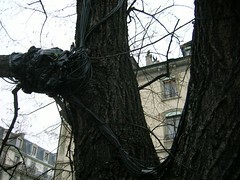 The tree on Place René Payot has a cold. Given a voice by astonishing, fabulous musician Daniel Bourquin, the tree neezes, sniffles, whines, complains. 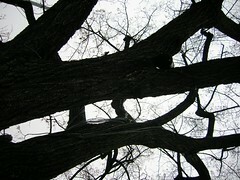 It's trying to rest but the approaching pedestrians passing under its branches or near its trunk distrub the tree's nap. Their presence can trigger an outburst of repetitite sneezes or even cause it to lose its temper! This lime tree, spending the winter naked, is inhabitated by scintillating lights which punctuate its moods and accompany the tone of its voice. Fifty discreet LED spotlights dot the tree's branches and light up along with the random voice samples.